Nearly a month has passed since the invasion of Oman's airwaves, and the Galactic Republic of Hi FM is in turmoil. Former Jedi Master Chris Fisher has organized a separatist movement against the Republic, known as the rebel alliance, Merge. The Republic contemplated creating an army to assist the crushing of the rebel alliance, prompting Senator Darren Shortt, to return to Planet Nawras to court them for free tickets to stuff, again. The Storm Troopers from Nawras were only too happy to assist the Republic's battle against the Merge rebels, and rolled out an extremely successful campaign that kept the citizens (listeners!) tuned to Hi FM. The Merge rebels were left as a minority, but had been secretly preparing an army of droids to assist them in their battle with Hi FM. The music being played by both stations is very similar, albeit a fairly high occurrence of tracks from the Slumdog Millionaire soundtrack. Meanwhile, the Ewoks were making technological advancements, but being teddy bears, seem to be loved by many hotels across the galaxy of Oman. The Ewoks have launched a campaign of giving away free meals to any hotel that will give them vouchers, and seem to have even started advertising for some companies. It seems that the more competition, the better things are for us citizens, the listeners. The Hi FM Republic forces have now recruited the services of a bounty hunter, called Bobba Fett, who likes to read the news a few times a day. Finally, a decent news service broadcast regularly giving world news - great! I wonder what the Merge rebels are going to do to respond to this? It seems that their RO 104.800 daily give away is not cutting it. The rebels have, however, managed to tempt lots of advertisers to do business with them. One wonders what their listener base is like though, it's really just Hi FM with some fancy branding as far as I can see so far when it comes to music being played. 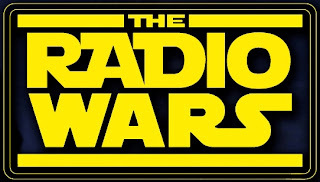 What can the Merge rebels bring to the table to fight the Hi FM Republic? Time will tell. HiFM's presenters are, except for Chris Fisher, better though, especially now that Rachy-Roo has f'd off. Credit to 90.4 for at least giving stuff away for their competitions- HiFM ask all these questions and get people to text the answer at bzs200 each and give nothing away! I am not a radio listener but do tune into 90.4 at 7 in the morning to catch the news. Then switch frequencies just to see what the others are up to. Luckily (or unluckily) if I happen to catch the presenter I listen for a while, otherwise switch back to BBC world service :). The couple of times I've managed to catch Chris Fisher on air, I have been left disappointed. I am being very honest here and I don't know how many out there (if any at all) would agree with this but I truly feel Chris Fisher doesn't know how to talk proper English let alone presenting on air. He sounds really nervous. Doesn't have a clue at times. Is at a loss for words at others. Daz on the other hand is spontaneous and extempore. Even when Daz is clueless he's entertaining. Mr. Fisher on the other hand is amateur at most. Sorry if I offend anyone, i'm just putting across my point-of-view. Seeing the hand waving 'good-bye' on the top right corner one might think that Merge is not going to be here for a long time, unless an until the owners keep it running as a matter of prestige. As far as the music is concerned, I have absolutely no idea, but I would guess Lady Gaga would sound the same on either frequencies :) I haven't mentioned Old faithful 90.4 cos Faiq's in a class of his own! whatever that means. Why no mention of the Classical music station?? Everything both stations play makes my head hurt. They're both awful. Rarely play anything but thumping club music.